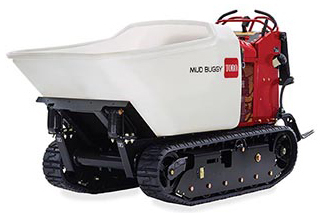 MB TX 2500 Tracked Mud Buggy – With controls that are intuitive and easy to use, superior traction and maneuverability, high weight carrying capacity, and a powerful engine, the Toro Tracked Mud Buggy represents the ultimate in productivity and jobsite efficiency. The power, productivity, durability, ease-of-use and service-friendly design all add up to a better ROI. Responsiveness of controls results in great maneuverability, particularly in confined areas. High weight carrying capacity and the powerful engine rises to the challenge at even the most intimidating jobsites. 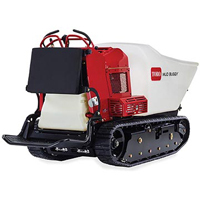 Large fuel tank capacity allows for all day productivity. Ideal transport speed means getting the job done on time. The traction controls are easy to learn, effortless to operate, smooth and responsive. The unique dump switch is linked to the movement of the traction control and is always near the operator’s thumb for easy access. Auto-return dump feature ensures the tub automatically returns to resting position so the operator can quickly focus on obtaining the next load of concrete. Suspended, ride-on platform results in less operator fatigue, folds up for ease of trailering. Max Load Capacity: 2,500 lbs. Tub Volume: 16 cu. ft. Powerful and proven 25 hp* Kohler Confidant engine. capacity, which improves durability and longevity. Endless Kevlar® reinforced tracks ensure maximum strength and performance. Belt, hydros and battery are all easily accessible. maintenance can be accomplished efficiently. other machines means less service time and cost.